One of the coolest scenes from Lord of the Rings: The Two Towers was the memorable battle of Helm’s Deep. 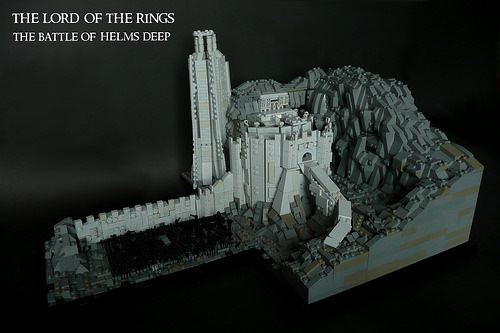 German builder KevFett2011 has created a beautiful rendition of this in micro-scale, using only a monochromatic palette. Kevin captures the essence of the fortress of Aglarond nestled into brick-built mountains perfectly, and I love how he has used levers to represent the attacking Uruk-hai pikemen. If you squint a little and look really close you can almost see Gimli and Legolas arguing over who has the highest body count.